Gutter clearing is often overlooked when it comes to home maintenance, yet it plays a very important part in protecting the outside of your home. The purpose of having your gutters cleaned is to make sure all the debris of dirt, moss and fallen leaves are removed to allow the clear flow of rain water to your drain pipes, clean gutters also make it easier to check for damage and leaks. Rooflines gutter clearing service is carried out using the SkyVac high reach vacuum clearing system to ensure maximum removal and clearing from ground level. Roofline will carry out a FREE survey using our wireless camera system to inspect your gutters and down pipes offering free advice and guidance. 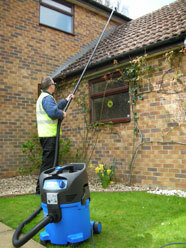 *Free survey carried only on completion of gutter clean, not available as a stand alone service. Call us today on 08000 191 373 or contact us online to see how we can help with your gutter clearing needs.